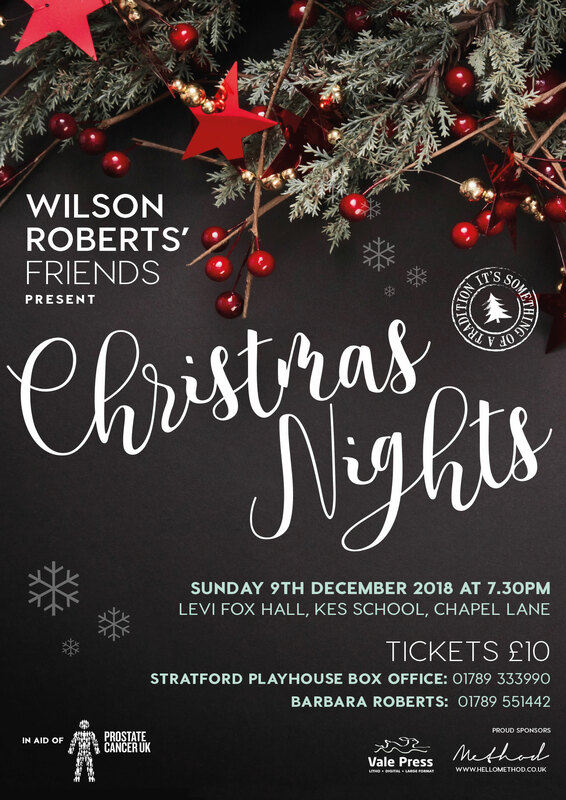 Mince pies have appeared in the shops, big budget ads are on the telly, and Santa is plotting his Christmas Eve route which can only mean one thing, Wilson Roberts’ Friends Christmas Nights is here again! Into its 17th year in Stratford-upon-Avon, this charity night in aid of Prostate Cancer UK was started by my Dad, Wilson Roberts, to support charities close to his heart, bringing together friends in both the cast and audience for a festive evening of songs, carols and jokes worthy of a cracker…..and a groan. The evening is a light-hearted warm way to start the festive period and get yourself feeling Christmassy. With a special guest appearance from a famous wizardry caretaker, the night is sure to be a memorable one. It’s an excellent opportunity to meet with friends and family to exchange Christmas cards and enjoy a festive drink. This year the show will be at the KES school in Stratford-upon-Avon on Sunday 9th of December 2018 at 7:30 pm.